The demolition of Borchert Field was completed on June 11, 1953, but the ballpark lingered longer in the memories of fans. 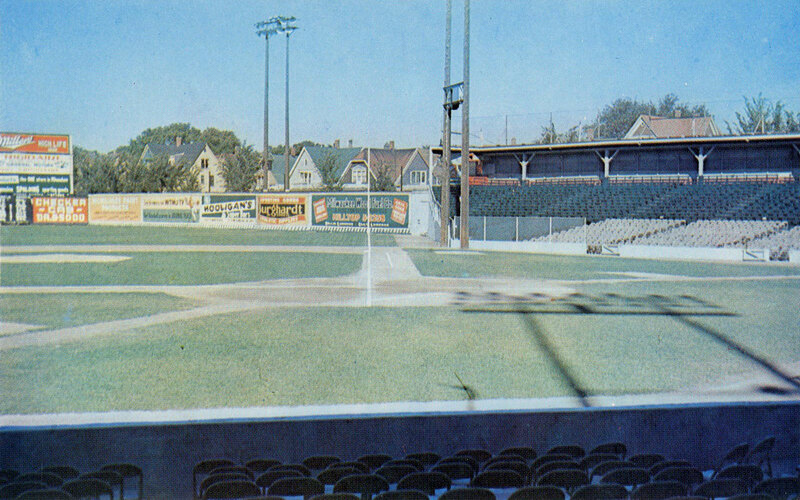 This "short run color" postcard of a very quiet Borchert Field was printed in 1976. 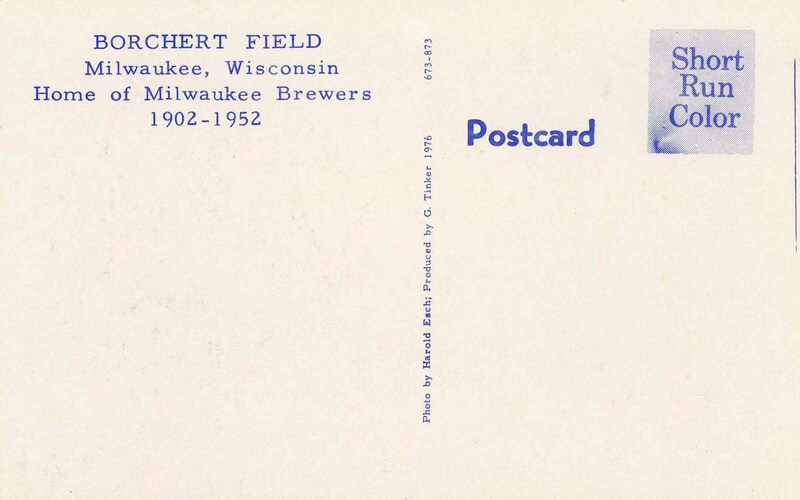 That makes it something of an oddity, produced during the fallow period after the Brewers were dead and buried—indeed, anyone at that time interested in past Milwaukee clubs would probably have stopped at the Braves—but before the retro craze revived mass commercial interest in old clubs and their ballparks. The photo itself, credited to Harold Esch, is undated, but perhaps we can narrow down the timeframe. We can start with the light standards. The infield lights are casting a shadow from behind the camera, but are not visible. 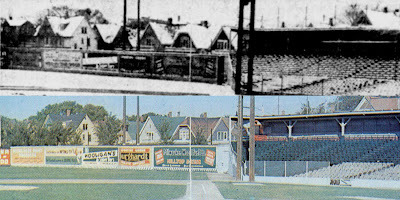 That helps, because those poles were originally placed on the field in front of the grandstand, and were moved outside the park in early 1942. So we know if it can't be any earlier than that. The outfield ads along that right field fence might be a better bet. They don't match the ads we know were in place in 1952. So 1952 is too late. 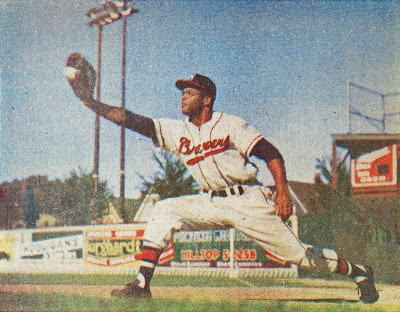 We can go one year earlier; this photo of first baseman George Crowe was taken in 1951. They are, from left, Hooligan's Super Bar at the corner of Farwell and North Avenues, Burghardt Athletic Goods (which had a long relationship with the Brews, even supplying their uniforms) and finally the Milwaukee Wood Fuel Co..
On the other hand, the billboard to the left doesn't match. And there's a large billboard over his shoulder that doesn't seem appear on the postcard. So that would seem to set the last date it could have been taken. Let's see if we can narrow down the earliest. In 1947, April snow forced the postponement of Opening Day. 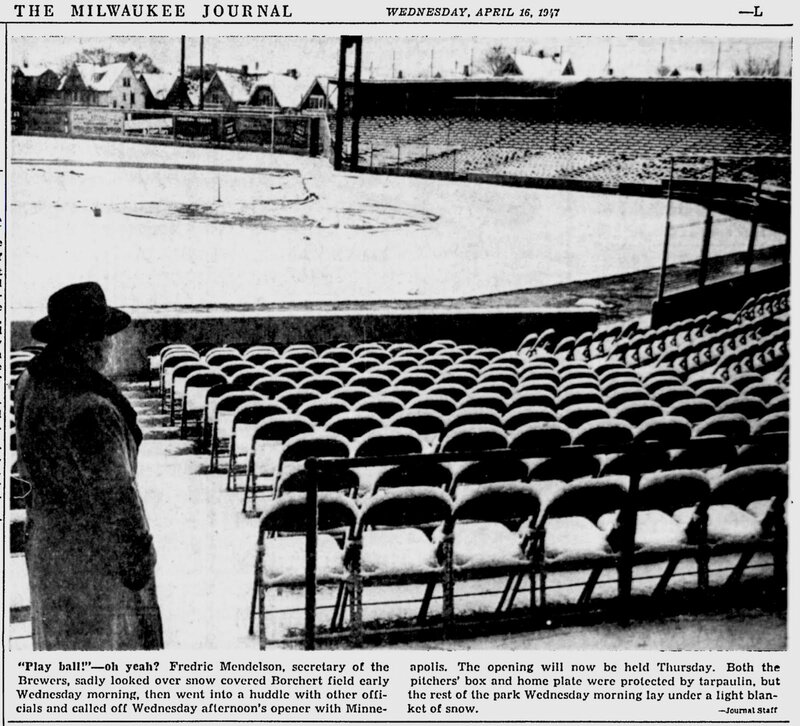 From the Milwaukee Journal coverage, we get a good look at the right field wall, as team secretary Fredric (Shorty) Mendelson gazes forlornly across the infield. It's an almost perfect match for the angle of Mr. Esch's postcard photo, allowing us to compare the ads plastered across the right field wall. Those are the same three from our George Crowe photo, plus Checker Cab Company on the extreme left. There are, however, two billboards which just as obviously don't match. I can't quite make out the left one on the postcard but the right is for WTMJ TV. The newspaper photo shows something different. So not 1947. I don't know how often the ads changed over; I'd expect some minor turnover every winter, but not within the baseball season. It seems reasonable to expect at least some ads to remain the same from year to year. There may be one other clue on that wall, though. 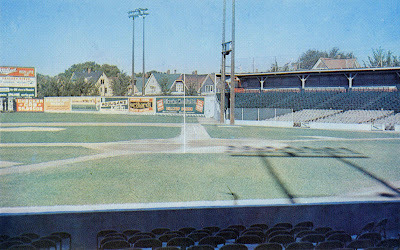 Look at the foul line: it runs right over the Milwaukee Wood Fuel Company's ad. 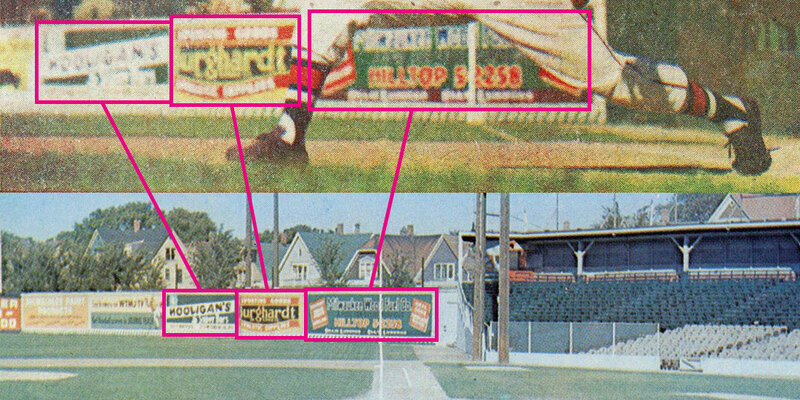 Very unusual; you'd expect the ads to be placed so that the foul line ran between them rather than through one. The original foul line was, in fact, along the right edge of that last billboard. It was moved as part of a general overhaul of the ballpark after the 1946 season, when the Boston Braves bought the team. One of the changes they made was moving home plate, shrinking the outfield but also improving the park's notorious sightlines. Moving the plate also required moving the foul poles, in this case thirteen feet to the north, resulting in the bisected ad. The trees appear to be in full leaf, indicating that it was taken during the spring or summer. We know that the spring of 1947 was unseasonably cold, and it seems unlikely that the outfield walls would have been repainted so soon after the park was overhauled, so I'll say we're now talking about early 1948 as the earliest possible date. Our window is now between 1948 and 1950. That's pretty good, but I'll keep looking and see if I can't get it any closer than that.